Silicate Salt Admixture Behavior in Concrete – What Does It Do? The silicate salt admixtures, generally comprised of sodium, potassium, or lithium silicates work by the formation of Calcium Silicate Hydrate (C-S-H) as the mechanism of closing void structure to decrease permeability of concrete. While a track record of permeability reduction may have been established, permeability reducing admixtures still have the problem of capillary and bleed water channel formation that is only partially addressed. No known technologies completely remove capillary and bleed water channel void structure when used as an admixture. The silicate admixtures introduce silica chemically bonded to a metal (typically sodium (Na), potassium (K) or lithium (Li)). Because the silica is chemically bonded already, the silicate salt requires a certain amount of energy to be spent from the concrete system to disassociate the cation (Na, K, or Li) from the silica. During this dissociation, other reactants are formed in addition to C-S-H including sodium hydroxide and potassium hydroxide, both of which have been found to be detrimental to concrete. Spray-Lock Concrete Protection (SCP) products contain colloidal silica – that is, a suspension of amorphous silicon dioxide (SiO2) particles that are sufficiently small enough not to be affected by gravity. 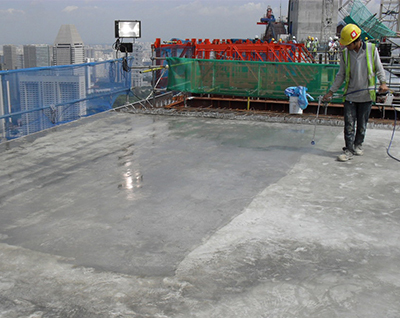 SCP products are applied after initial set of the concrete – after capillary and bleed water channel formation. SCP products then enter the concrete, reacting with available alkalis. SCP product particles are chemically the same as silica fume, but many times smaller, which provides significantly more surface area to improve the pozzolanic reaction over that of even silica fume or metakaolin. The pozzolanic reaction is the conversion of calcium hydroxide to C-S-H. With SCP products, C-S-H fills the void structure of the concrete within the reaction zone, providing many benefits to concrete. Because SCP products contain unbonded silicon dioxide particles that are very small, they are ready to combine chemically with calcium hydroxide with no dissociation energy required. The resulting reaction products are even longer-chain, more stable C-S-H than primarily formed by cement hydration. [i] This improved C-S-H structure leads to greater performance of SCP products than that of silicate admixtures, or other waterproofing admixtures. The following table represents SCP’s published test results compared to a leading silicate admixture brand’s published test results. [i] Kontoleontos, F., Tsakirdis, P., Marinos, A., Kaloidas, V., & Katsioti, M. (2012). Influence of colloidal nanosilica on ultrafine cement hydration: physiochemical and microstructural characterization. Construction and Building Materials 35, 347-360. Another important concern when evaluating silicate salt admixtures versus colloidal silica is the delivery system. Silicate salt admixtures are introduced into the mixer truck in powder form, usually by the concrete plant or construction personnel at the rate of 20-60 lbs. per cubic yard. On a 10-cubic yard load, this translates to 200 to 600 lbs. of material that must be handled manually and introduced into a turning drum. Safety concerns, from lifting to inhalation hazards, are associated with manual loading of any powder into a mixer truck. Conversely, SCP’s brand of colloidal silicas is spray-applied in liquid form on fresh or existing concrete, and contains zero VOCs. Concrete permeability reducing admixtures may be effective in some cases, but bleed water channels and capillary structure are likely to still be present in all conventional concrete. SCP products have the advantage of closing capillaries and bleed water channels with reaction products after they have formed. Additionally, the use of SCP products remove the safety hazards associated with plant-dosing of concrete trucks with a powdered product.